And no, this isn't the latest Internet abbrev. Obvi. Not gonna lie. That's a kind of scary recreation of a fake lizard who likes to stomp down cities. The final installment of the Hirshhorn Museum's OMGodzilla Summer Camp takes place Thursday at 7 p.m. in the Ring Auditorium (Independence Ave. and 7th St. SW). As you have probably already figured out, this summer's theme is Japan's favorite giant lizard, Godzilla. Over the previous two weeks, audiences have watched Godzilla battle it out in "Godzilla vs. King Ghidorah" and "Godzilla vs. the Sea Monster." 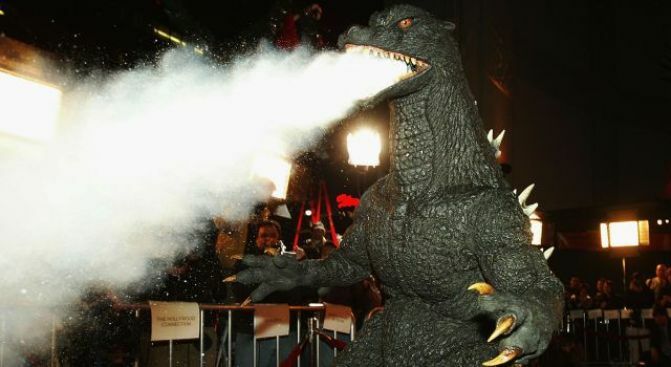 And now, the three-part series comes to a close on Thursday with a free showing of a dubbed version of "Godzilla 2000" followed by insights from film scholar David Wilt. Because that's all "Godzilla 2000" needed, was insights from a film scholar. Yup. And just a funny thought to end on: Imagine Godzilla stomping through the Sculpture Garden, crushing Calder's and Koons' masterpieces with every step, and drinking from the reflecting pool. No? Well, we thought it was funny.